Aikido is the martial Art of Peace. Its name consists of three characters: Ai, which means “to harmonize”, “to meet”, Ki which means “energy”, “breath” and Do which means “way”, “path”. 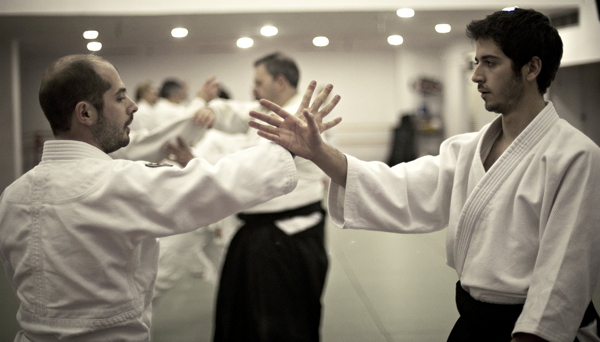 As a whole, Aikido means “the Way of Harmony with Universal Energy”. 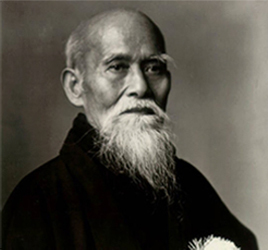 The Founder of Aikido, O-Sensei (honorific title in Japan, meaning “The Great Teacher”) Morihei Ueshiba (1883-1969) was a charismatic figure and through his Art, he spread the spirit of Japanese Budo all over the world. He was a man of short stature and as a child he had a fragile health. However, due to his strong spirit and dedication he became a world famous martial artist. Aikido expresses the inner need of the Founder, to deliver a lively message around the world. The war does not end when a person becomes more destructive than his opponent, but when he refuses to act in a destructive way. People are born with the instinct of self-preservation and when they grow in competitive environments, quite often they adopt either defensive or aggressive attitudes. This pattern creates tension and conflict in social life, thus disrupting the natural flow of energy. Τις απογευματινές και βραδυνές ώρες της προπόνησης υπάρχει άφθονος δωρεάν χώρος στάθμευσης ακριβώς κάτω από τη σχολή. 21, 25, 26, 27, 29, 32, 34, 35, 56, 57, 64, 83.